This series (planets/moons) naturally evolved from the Origins series I first exhibited at the Naked Eye a few years ago. They were looking at the cosmos from more of a distance and laying on the notion of we are all children of the stars in terms of our atomic makeup all originating in stardust/nebulae/supernova etc. The planet/moon paintings were zooming into these galaxies, still allowing me to use loose and experimental methods of paint application but this time the arena of play was within a circle. This more graphic composition allowed me to combine two ways of working - expressive/serendipitous and allowing the paint to do its thing along with me rendering it in a clean, controlled circle. 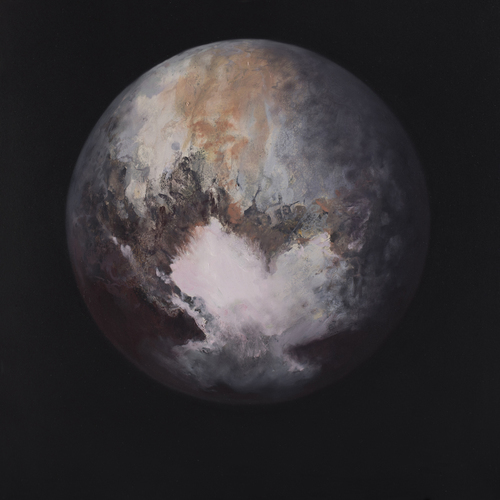 I work in series and this body of work came from seeing one image of Pluto that cemented the idea of a circle in a square. For these to retain a freshness I would work on the whole canvas for each layer. They start as completely black and then I work on the flat until I'm happy with the surface of the sphere. Then a lot of repetitive brushwork around the edge of the circle to get the fuzzy/atmospheric quality. Oil paint does work quite naturally to evoke a variety of terrains depending on what you do with it. Not sure. I would like to say interesting. I want to produce interesting/strong images that resonate with the viewer but that is all relative I suppose. I see it as a way of trying to make sense of things through whichever process I use. My art is constantly evolving. It has evolved loads over the last 10 years. I tend to follow ideas that I want to explore prompted by either an image I have seen, places I've experienced or a conversation I've had. I use a range of media. Largely oil paint but I am currently working with charcoal and exploring what I can do with it. I'm focusing on the formal elements of edges/shapes/tone. I like the challenge of creating clean lines with a really dirty material. I see my work constantly evolving and I like having time to experiment and make discoveries that can define the direction my work will take or at least note down to investigate at another time. 4. Where did the fascination with astronomical art come from? I haven't really been fascinated with astronomical art as such. I was always interested in space - a bit of a Star Wars obsessive. But it was more the NASA/Hubble photography that I love. The imagery of these other gaseous, dusty, liquidy worlds really lent themselves to painting with oils. I was using the formal elements of what was going on in these to dictate the techniques I would use to create my own galaxies. I always mention Willem De Kooning's Door to the River painting in terms of a key work that inspired me to paint. I love that through a few vigorous brush strokes he could take you to another realm. The first series of Origins (mentioned above) that I exhibited alongside Ian Hodgson at the Naked Eye were each a colour from the spectrum that constitues white light. I am a bit on the spectrum I think like a lot of artists and I like a lot of science diagrammatical imagery and I like to have a concept behind a collection of works that holds them together. 5. You have been known to draw portraits of famous individuals - what is it about a certain person which will compel you to draw them? That is how I started painting with my oldest friend Antony McAndrew who is a great illustrator/artist. We would hang out on Friday nights as teenagers and paint portraits of our favourite popstars. My exhibition in 2010 You Make Me Gay was a collection of 27 oil portraits of my own personal gay icons. They were a mix of musicians, performers, family, friends and fictional characters from film and TV that resonated with me, contributing to who I am today. The level of fame was irrelevant. it was the impact the individual had to facilitate my personal evolution. I always channel Jill Tyrrel from Nighty Night whenever I need to. I also did a large piece in NOrth and South exhibition (again with Ian Hodgson at Naked Eye) with 250 pencil portraits of everyone I had or have had some form of relationship with so friends/family/colleagues/partners etc. It was a great aid memoire to transport me back to specific times and experiences with the individual. It was called Mindmap and a bit of a nod to Tracy Emin's tent but in pencil and paint. There were a couple of famous faces on there but again it wasn't a compulsion to draw them but rather to fulfill the brief I'd set myself for the piece. I used it for the proposal that got me to the Brighton Blow Up commission back in 2012 where I made a similar drawing of all the artists at Phoenix Studios that was blown up onto a huge banner at the front of the building. 6. What are your sources of inspiration? As mentioned above - imagery from pop culture/my travels/conversations regarding concepts to explore act as starting points but the real inspiration comes from the process of making art and discovering in the studio. 7. What makes a memorable piece of art? Something arresting. It doesn't matter what medium as long as something interesting has been done with it. I like to see a confidence and understanding with materials. I also like drama in work and a contrast between light and dark. I am also drawn to ambiguity and something a bit odd evoking a feeling/transporting you somewhere. It's when you start making changes that start to drain the life out of it. I'm learning this all the time and often the life has been totally drained. It also varies in different projects/medium. It's hard to put a finger on it as I am sure a lot of artists would say but somthing pings when you look at it, every part optically works for you and there is some tension in the piece. I am learning to let things breathe a bit more. 9. What are your tips for aspiring artists? 10. Which artists have inspired you? Gerhard Richter, Robert Rauschenberg, El Greco, Richard Diebenkorn, De Kooning, Turner, Goya, Velazquez, Titian, David Bomberg, Francis Bacon, Caravaggio, Joseph Wright, Philip James De Loutherbourg, Hughie O'Donoghue, Peter Doig, PJ Harvey, Goldfrapp and more. A lot of these weren't/aren't afraid to change direction. 11. What is your favourite piece of artwork you have done and why? I'm really enjoying my current pieces in charcoal. One in particular is Orbital - all about edges/areas/tone which is channelling my love of geometric/abstract art in a material not usually associated with it. Stems from a photograph I took underneath the M25. 12. What do you hope viewers will take away from your artwork? A feeling, whatever that may be. 13. Is there a particular message you are trying to convey to the viewer? Not per se. Some work may raise more questions depending on the content/title. 14. What is next for you? I will be continuing exploring charcoal for the foreseeable future. I am really excited about it. Also been collaborating with Dawei Zhang on some more drawings that hopefully will end up somewhere. I am also developing a 3 person exhibition with a couple of Phoenix artists – Ian Boutell and Phil Cole, aiming for November. I was always drawing pencil and pen and ink portraits of Elvis and Johnny Rotten when I was at school so the subject matter hasn't really evolved that much, except I try to do less known, recognisable icons now. I haven't got one particular favourite but if I had to pick one it would probably be this portrait I did of my Grandad in his RAF uniform in WW2, for obvious reasons. I did it for a birthday present for him and he used to salute it every time he walked past it. Three well known artists that have influenced me are Herge, Robert Crumb and Jamie Reid. Besides that I tend to be more influenced by friends who are artists as well, as you can bounce ideas off each other. It's usually difficult to know when a piece is finished because I'm a bit of a perfectionist and I always think I could do something more to improve it....but then you can overdo it so there's a fine line. I'd say it's when I reach the point when I've had enough, I'm usually sick of the sight of a painting after working on it for a few weeks! Someone who bought one of my Muhammed Ali prints once told me he looks at it every morning before he goes to work and it makes him feel good, which was a really nice compliment. If my work brightens up someone's day then that's good enough for me!